Prepare quinoa in water or stock (chicken, vegetable, or mineral), let cool. Place rinsed and chopped kale in bowl, and gently massage with clean hands for 5 minutes or until the kale has become soft and a vibrant green. 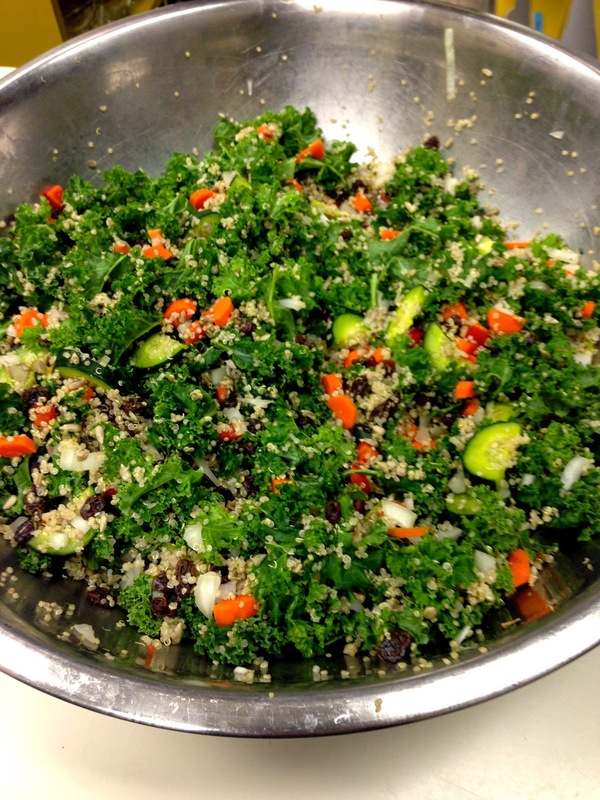 Combine the rest of the veggies, fruit, and nuts/seeds, as well as the cooled quinoa. Wisk together the ingredients for the dressing and combine with salad. Store in air-tight container for up to a week. I also was able to create a Nutrition Facts label for this recipe with a food processing program that my school has. Each serving is about a cup of the salad. Check out that vitamin A and fiber content!